Drawing pads, pencils and tablets are linking a global sketching community that has just extended into Languedoc. 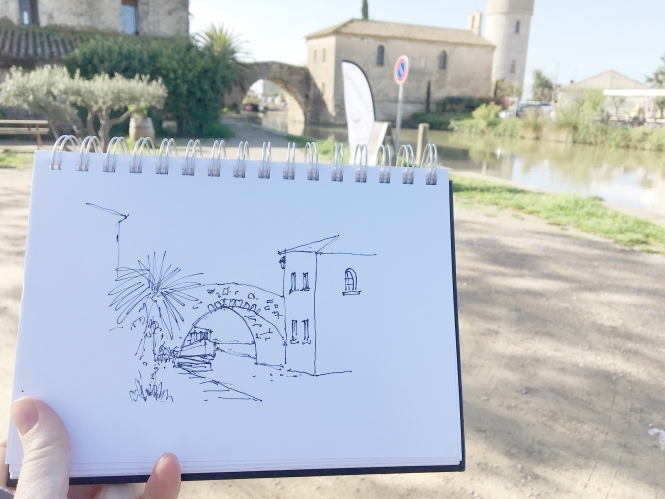 A new chapter of Urban Sketchers Languedoc has been set up by Annette Morris and its events have seen people come together to share experience and encourage others to make more of their landscape. Sketching sessions are free and anyone can join in, whether a first timer or with some experience. “Urban Sketchers Languedoc is part of a global initiative called Urban Sketchers and there are groups all over the world. There were only four official ‘chapters’ in France and they are further north so I wanted to create one here. “Just a short while ago we were accepted to join the worldwide network which is really exciting. Our group is a bit unusual as we are not based in a city and as we are far more rural than urban, I created it for the whole region and we host meet-ups in different towns and villages. “We are a truly mixed, international group with French, Dutch, Canadian, Belgian, Hun­garian, Australian, British ... anyone who wants to draw. “It is a bilingual group, so also great for anyone who wants to improve their French. Some people have not drawn since school and others are professionals, but there is no pressure: “Sketching is a spontaneous activity. It is like telling a story by drawing. Everyone has their own version. After an event, sketchers are encouraged to share photos of their sketches on the group’s Facebook page. The idea for Urban Sketchers began in 2007 in Seattle when journalist and illustrator Gab­riel Campanario created an online forum for sketchers who draw on location, not from photos or memory. Ms Morris is keen to see new people join in: “It has grown over winter. Often there are between 20 and 30 of us, fewer if the weather is bad. Meet-ups are monthly, on the first Wednesday, with Lagrasse, Aude, on July 4 and Roque­brun, Hérault on August 1. There is a special meet in Béziers, Hérault, on July 21 for the 60th global Sketchcrawl.